Kanut the van, Fin the child, Shiz the woman, and Blaz the man. Together, we’re driving around the US to see the various wonders the US holds. Starting from Seattle, over the course of a year-and-a-half or so we’ll drive East through the Midwest, spend autumn in the Northeast, head South for winter like a flock of ducks, then head back West. Like all plans, this route may change, but wherever we go we’ll find something nice to see. We traveled fast and covered a lot of distance in very little time during that trip; after we settled in Seattle we began to talk about how we’d do it differently were we to do it again. We deceived that for the next trip we’d like to go a little slower and have a more consistent home. We began reading up on Westys and scouring our local Craigslist for good vans. After six months and seeing countless vans, we shelled out the money for Kanut. 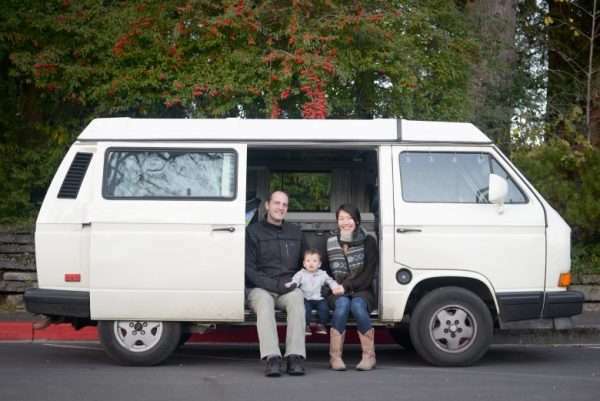 We took him camping in the Pacific Northwest in the summer and started to fantasize about what it would be like to drive Kanut around and live out of a van, along with the logistics of how to do so. Along came Fin and some changes to my job that allowed me to work remotely and we realized that our chance had come. Everything had lined up in such a way that if we were to undergo this trip, the time to do so is now. During this trip we’re looking to see all the geographic diversity the US holds, from soaring mountains to humbling oceans, from serene lakes to scorching deserts. Shiz is an incredible photographer, so she’s looking to capture the world in moments. I study Aikido, so I’m looking expand my studies through visits to dojos around the country. Fin will probably just lick everything. I’m still working during this trip, so we’re renting AirBnbs from Sunday night until Friday midday so that I can work, and then camping on the weekends. Our campsites are going to be midway between the AirBnbs to give us time to see everything and let Fin run around. For the AirBnbs, we’re looking for small- and mid-sized cities so that we can see the unique aspects of any place we stay while still having access to interesting things.